Bairro Alto is a central district of the city of Lisbon, the Portuguese capital. 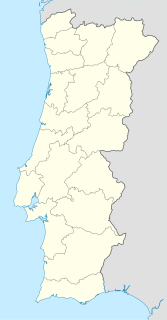 Unlike many of the civil parishes of Lisbon, this region can be commonly explained as a loose association of neighbourhoods, with no formal local political authority but social and historical significance to the urban community of Lisbon and of Portugal as a whole. Belém Tower, or the "Tower of St Vincent", is a fortified tower located in the civil parish of Santa Maria de Belém in the municipality of Lisbon, Portugal. It is a UNESCO World Heritage Site because of the significant role it played in the Portuguese maritime discoveries of the era of the Age of Discoveries. The tower was commissioned by King John II to be part of a defence system at the mouth of the Tagus river and a ceremonial gateway to Lisbon. 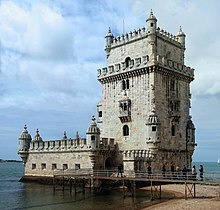 Belém, whose name is derived from the Portuguese word for Bethlehem, is the southwesternmost civil parish (freguesia) of the municipality of Lisbon. Until 2012, the area of Belém had its own historic parish, named Santa Maria de Belém. 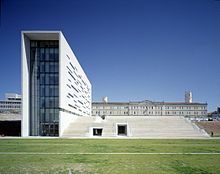 In 2012, the Administrative Reform of Lisbon resulted in the merging of the latter and the parish of São Francisco Xavier, thus creating the new parish of Belém. Located at the mouth of the River Tagus, it is located 6 kilometres (3.7 mi) west of the city centre and 2 kilometres (1.2 mi) west of the Ponte 25 de Abril. Many of Portugal's distinctive buildings and landmarks are located in this area, including the Jerónimos Monastery and the Tower of Belém. The population in 2011 was 16,528, in an area of 10.43 km2 (4.03 sq mi). São Jorge Castle is a Moorish castle occupying a commanding hilltop overlooking the historic centre of the Portuguese city of Lisbon and Tagus River. The strongly fortified citadel dates from medieval period of Portuguese history, and is one of the main tourist sites of Lisbon. 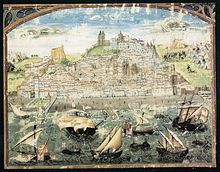 Municipium Cives Romanorum Felicitas Julia Olisipo was the ancient name of modern-day Lisbon while part of the Roman Empire. Ribeira Palace was the main residence of the Kings of Portugal, in Lisbon, for around 250 years. Its construction was ordered by King Manuel I of Portugal when he found the Royal Alcáçova of São Jorge unsuitable. The palace complex underwent numerous reconstructions and reconfigurations from the original Manueline design, ending with its final Mannerist and Baroque form. The Praça do Comércio is located in the city of Lisbon, Portugal. Situated near the Tagus river, the square is still commonly known as Terreiro do Paço, because it was the location of the Paços da Ribeira until it was destroyed by the great 1755 Lisbon earthquake. After the earthquake, the square was completely remodeled as part of the rebuilding of the Pombaline Downtown, ordered by Sebastião José de Carvalho e Melo, 1st Marquis of Pombal, who was the Minister of the Kingdom of Portugal from 1750 to 1777, during the reign of Dom José I, King of Portugal. The Convent of Our Lady of Mount Carmel is a former Catholic convent located in the civil parish of Santa Maria Maior, municipality of Lisbon, Portugal. The medieval convent was ruined during the sequence of the 1755 Lisbon earthquake, and the destroyed Gothic Church of Our Lady of Mount Carmel on the southern facade of the convent is the main trace of the great earthquake still visible in the old city. The Pombaline style was a Portuguese architectural style of the 18th century, named after Sebastião José de Carvalho e Melo, the first Marquês de Pombal, who was instrumental in reconstructing Lisbon after the earthquake of 1755. 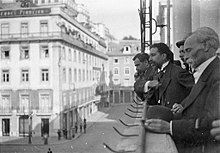 Pombal supervised the plans drawn up by the military engineers Manuel da Maia, Eugénio dos Santos and Elias Sebastian Pope. The new city was laid out on a grid plan with roads and pavements fixed at 40 ft wide (12 m). 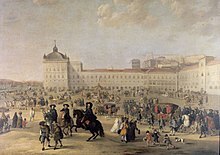 The previously standing royal palace was replaced with the Praça do Comércio which along with square Rossio defines the limits of the new city. Maia and Santos also outlined the form of the facades that were to line the streets, conceived on a hierarchical scheme whereby detail and size were delineated by the importance of the street. These were in a notably restrained neoclassical style partly the result of limited funds and the urgency of building but also thanks to the enlightenment concept of architectural rationality adhered to by Pombal. A standardized system of decoration was applied both inside and out with a distinctively reduced application of azulejo tiling. Avenida da Liberdade is an important boulevard in central Lisbon, Portugal, famous as one of the most expensive shopping streets in Europe. Originating in the Passeio Público, an 18th-century park built for the Portuguese nobility, the avenue was built in 1879, when the former park was turned into a major boulevard, marking the northward expansion of the city during the 19th century. It has since become one of the most prestigious addresses in Portugal and one of Europe's most popular luxury shopping destinations, as the home to numerous luxury stores, boutiques, and hotels. The Avenida is also home to numerous embassies and diplomatic missions. The history of Lisbon, the capital city of Portugal, revolves around its strategic geographical position at the mouth of the Tagus, the longest river in the Iberian Peninsula. 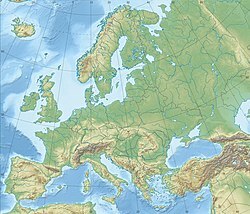 Its spacious and sheltered natural harbour made the city historically an important seaport for trade between the Mediterranean Sea and northern Europe. 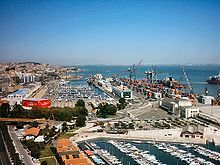 Lisbon has long enjoyed the commercial advantages of its proximity to southern and extreme western Europe, as well as to sub-Saharan Africa and the Americas, and today its waterfront is lined with miles of docks, wharfs, and drydock facilities that accommodate the largest oil tankers. The Praça do Império is a city square and park situated adjacent to principal monuments and tourist attractions in the civil parish of Belém, municipality and Portuguese capital of Lisbon. The Bica Funicular, sometimes known as the Elevador da Bica, is a funicular railway line in the civil parish of Misericórdia, in the municipality of Lisbon, Portugal. It connects the Rua de São Paulo with Calçada do Combro/Rua do Loreto, operated by Carris. Although commonly described as a funicular, technically it does not qualify because the traction is not provided by a mechanical cable but by electric motors on the two cars. The cable links the two cars together so that they ascend and descend simultaneously, each car acting as a counterweight for the other one. Livraria Bertrand is the oldest and largest bookstore chain in Portugal. Since it was launched in 1732, the Chiado Bertrand Bookstore stayed open, and has thus entered the Guinness Book of World Records as the oldest bookstore in the world still in operation. 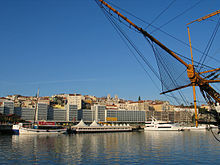 The Port of Lisbon is the third largest port in Portugal, located where the River Tagus and the Atlantic Ocean meet, in the Portuguese capital of Lisbon. Due to its strategic location on the Portuguese coast between Europe, Africa, and the Atlantic, the port is one of the most accessed and utilized in Europe, and is close to the cruise ships terminals.